As the economy weakens, and well-performing investments seem harder and harder to come by, how can you protect your money from the effects of double-digit inflation? TradeWHEN offers you an ideal solution. We will tell you when to buy or sell your investments. We'll help you find the best times to sit on the sidelines when the market is at its worst, and then jump back in when conditions improve. Make the stock market reward you with superior returns regardless of market conditions. TradeWHEN can even work with the investments you already have in your IRA or 401k. Backtesting: The chart shows an average yearly return of nearly 30% with less than 10% drawdown in our portfolio of mutual funds by following the TradeWHEN signals over a period of nine years. No short selling, no margins, no whipsaw trades. Put the antacid away and enjoy investing again. Not only has this worked, it is easy to do. Our custom computerized system analyzes the stock market each evening, then makes recommendations each night. You simply check and follow the instructions, if any, for the following trading day. The marketplace is crowded with investment advisors, stock picking newsletters, and stock timing systems of all shapes and sizes. How is TradeWHEN better? The TradeWHEN system is the result of 20 years of research and development, and runs on our custom-developed software. 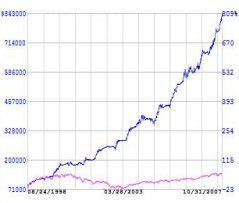 The performance you can see on our results page have been backtested and confirmed using 20 years of stock market data, and a real version of this system was used under authentic market conditions from 2002 until 2008, when this website was launched. TOO MANY TRADES: Most market timing systems expect you to make dozens, or even 100 or more trades per year. That could cost you a lot in commissions, which may not even be considered in their profit projections. Plus, if you are trading inside your retirement plan, you might even be prohibited from making so many trades. TradeWHEN's systems typically require just 1 to 2 roundtrip trades per year. TradeWHEN's systems do not generate whipsaw trades. It would be rare for you to hold a position less than a month. In fact, TradeWHEN is one of the only systems compatible with mutual fund families like Fidelity, where you can be penalized for holding a position less than 30 days. INCONSISTENT PERFORMANCE: Many of the other stock timing systems will give you wild roller-coaster rides on the stock market. You may have a great year where you earn 70, 80, 90% on your investment, only to be followed by three consecutive years of losses. The average yearly return fron a system like this can look great, but when you climb on board, be prepared for the fright ride of your life. TradeWHEN has trading systems specifically designed to smooth out the bumps on the stock market highway. Our timing systems, when properly imlemented, can help provide you with consistently superior returns while never allowing you to experience excessive drawdown. ALL YOUR EGGS IN ONE BASKET: You would never put all your money into just ONE stock - no matter how highly regarded that stock is, that's a dumb strategy. Who knows what might happen someday? Trusting all your money to the trading signals generated by ONE stock market timing system is just as dangerous. TradeWHEN has dozens of trading signal sets available. Diversifying your money among several sets of timing signals is just as important as diversifying your investments, and serves the same purpose. It helps protect you from unforeseen risk, and smooths out the fluctuations in your returns. TOO EXPENSIVE: Buyer beware! The pricing of most stock trading systems is often based on the amount of publicity and hype they have been able to generate. Do not assume the price has anything to do with the quality of the product. If you intend to shop around, print out this page to help you. TradeWHEN has plans that start as low as FREE. Even our best plans are far more affordable than competing services. Join soon, and lock in today's low rates!